Broadcast on KPFK, Close Radio, March 14, 1977, 14 min. 52 sec. The artist receives and responds to polite instructions by phone. By 1957, Kaprow’s work became exclusively environmental, involving lights, electronic sounds, odors, and other unusual materials. In 1958, Kaprow exhibited his first “arrangements” at Hansa Gallery. Containing no art objects as such: the art was experienced as a surrounding rather than a picture or sculpture to be looked at—a surrounding which engaged the visitor with things to move, switches to manipulate, obstacles to climb, and food to eat. For the next seven years, he expanded the potential of the "Environment," as it came to be called. Gradually the showcase space was abandoned for more informal and natural settings such as vacant breweries, open fields, beaches and woods. Invitations for Kaprow, and commissions for such works, came from universities in the United States and from art institutions abroad. 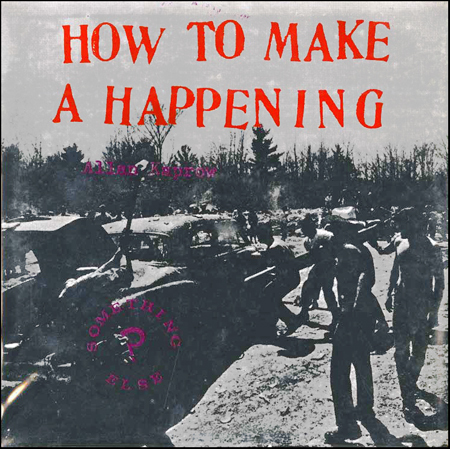 In the same period of 1957–58, Kaprow developed the "happening" as an extension of the environmental concept; contributing an unexpected concept and household word to our spoken language, in the process; and an art form, Happenings, that in various ways and under different names has been practiced all over the world.